EVENTS - Gary's Collision Center - For all your auto body needs! THANKS TO EVERYONE WHO VISITED OUR BOOTH AT CRUISE NIGHT! CONGRATS TO THE MUFFLER RAPPING CONTEST WINNERS! PROUD SPONSOR of the FORRESTON SAUERKRAUT DAY CAR & BIKE SHOW! THANK YOU TO EVERYONE WHO CAME OUT TO THE FORRESTON SHOW THIS YEAR! SEE YOU NEXT YEAR! THANK YOU TO EVERYONE THAT DONATED SOCKS AND WARM CLOTHING THIS YEAR! WE WERE ABLE TO DONATE 4 BOXES TO THE FACC! Gary's Collision is collecting new wool socks and long underwear of all sizes, men's and women's, for the Freeport Area Church Cooperative (FACC). Now through December 24, bring your donations to our office during business hours at 304 E. Washington St. in downtown Freeport. 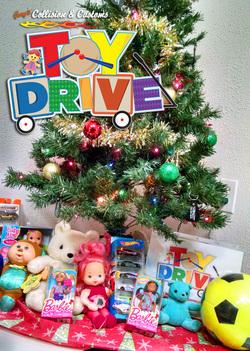 Thank you to everyone who donated to Gary's Collision & Customs TOY DRIVE this year! We were able to donate toys for the New Life Community Center Toy Giveaway, and also donate boxes of toys to F.A.C.C.